Tuesday Tribute: Ride, Sally, Ride! When I was 9, my fourth-grade teacher said we could do a report on anyone in American history, so I picked five women: Dolly Madison, Betsy Ross, Martha Washington, Eleanor Roosevelt and Sally Ride. My mom definitely inspired the first three–she’s a Revolutionary War buff–but I picked the last two. I wrote my report from my mom’s set of encyclopedias (kids: “encyclopedias” are like the internet, only heavier and smelling more like a basement), and when it came to cover Sally Ride, I found…. nothing. I went to the library. Nothing. The high school library: nada. 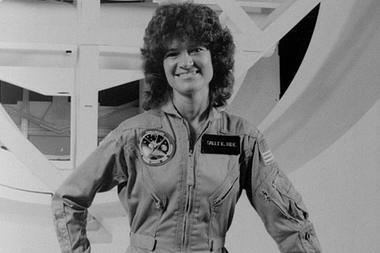 I turned in the report, decorated with an American flag on the front, and was bitterly disappointed that I couldn’t include Sally Ride. How on earth could a woman be an astronaut and the books not have ANY information about her? HOW? Fortunately, in the intervening years we’ve had the internet, where you can get everything you need within a reasonable degree of accuracy. We’re not talking launching into orbit, after all; we’re talking just a general “who was she?” And even after thirty years, it turns out we didn’t know everything there was to know about her, because after she died yesterday at age 61, of pancreatic cancer, her family announced that since 1985, she’d been in a long-term relationship with Dr. Tam O’Shaugnessy, a woman. This news horrifies me to some extent: an American hero, who was my own hero for some time, didn’t want anyone to know she was in a loving relationship. By all accounts she was “intensely private,” and while I respect her decision and the difficulties coming out might have caused during her career, I’m so saddened that only in death can her love be celebrated. Other women get their marriage announcements in the NYTimes style section. Hers appeared in the obituaries. Sally, I would’ve loved you anyway; we all would have. Thank you for your strength, bravery and your lifelong dedication to education (http://sallyridescience.com). This entry was posted in Tuesday Tribute and tagged sally ride, spacecamp, tuesday tribute. Bookmark the permalink. Such a lovely and fitting tribute to Sally Ride…as well as Encyclopedias. So sad, indeed, that her wedding announcement was in her obituary. Maybe things will change for our daughters. PS: I love Kate Capshaw and Tom Skerritt in Space Camp.